Tileguard Concrete Floor Sealer is ideal for sealing concrete and natural stone surfaces in hard wearing areas both indoors and outside. It is designed to provide excellent protection from staining and soiling as it is dust proof and helps stabilise. It will also enhance the natural colour of the concrete or stone surface. Concrete Floor Sealer can also be tinted however it is not recommended for use around wet areas such as swimming pools and when tinted it is not recommended for driveways and carports. 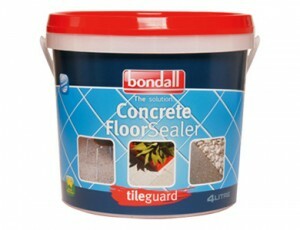 Available from Bunnings Warehouse, and you can find more information about Sealing Concrete with Tileguard Concrete Floor Sealer here. Posted in concrete floor sealer, Outdoor tile sealer, slate sealer, Tile sealer. Tileguard comprises of a range of sealers and cleaners ideally suited for use around the home. No matter what surface you need cleaned or protected, the Tileguard range had a product suitable for the task. From Kitchen, Bathroom, and Laundry tiles to outdoor terracotta and concrete, the solution is Tileguard. © 2019 Tileguard Sealers and Cleaners, all rights reserved.